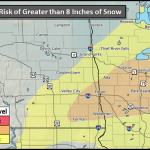 The National Weather Service tells KBMW News that yet another winter storm is on the way and is expected to impact eastern North Dakota, northwest Minnesota, and west central Minnesota. 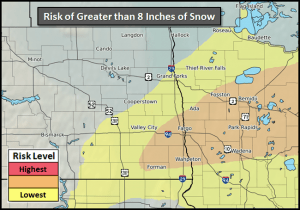 The primary hazards are the potential for a narrow band of heavy snow, as well as blowing snow. Wind gusts could reach speeds of 25 to 35 miles per hour, causing blowing snow to reduce visibility. Dangerous wind chills are anticipated as well; these could last through the end of the week, and drop temperatures to -20°F and -45°F.